Small-scale distributed solar photovoltaic (PV) systems, such as those found on residential and commercial rooftops, have grown significantly in the United States over the past several years. Starting this month, the U.S. Energy Information Administration (EIA) is including monthly estimates of small-scale distributed solar PV capacity and generation by state and sector in EIA's Electric Power Monthly. From this I get 7,691 MW (ac) distributed solar capacity in the United States. The head of the IESO recently claimed "Ontario currently has about 1,800 MW of distribution-connected solar..." That's a rather large story, given that it is 23.4% of the entire U.S. capacity. 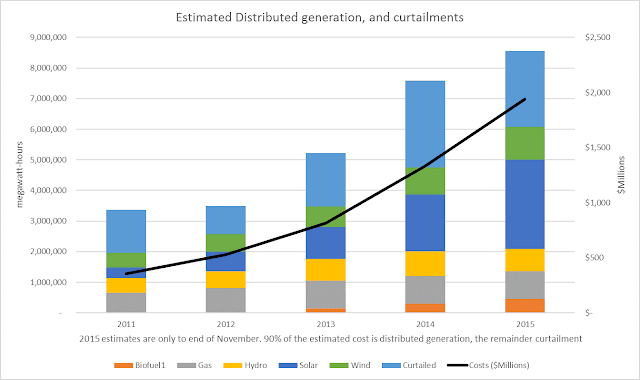 I continue to estimate the costs of distributed generation, and supply curtailments. My methodology has changed over time, each time altering past estimates a little, and I've adjusted 2014 figures to co-ordinate with the 1.8 TWh total shown in the Auditor's report, again changing past estimates. It's apparent to me that a large component of increased costs of generation in Ontario is due to elements that are infrequently reported - such as distributed generation and particularly the distributed solar generation the Auditor notes costs 3.5 times more than in other jurisdictions. Exorbitantly paid with minimal transparency, it's not difficult to believe Ontario's distributed solar capacity is 23.4% of the US total. The Auditor's report brings up some good points on wasteful conservation spending. I re-recommend Brady Yauch's excellent summary of that issue, A $2.6-billion stimulus for Ontario.